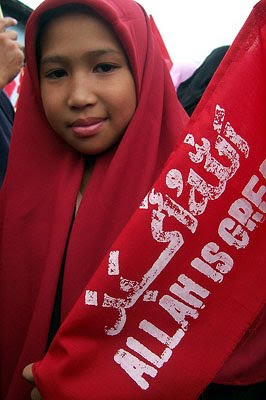 A Muslim girl holds a banner with markings "Allah is Great." MARAWI CITY, Philippines (Mindanao Examiner / Mar. 10, 2011) - Various groups in the southern Philippine province of Lanao del Sur have bonded to support the government peace and development programs, security officials said on Thursday. Officials said the stakeholders also signed a covenant to aggressively pursue the government efforts during a peace and order council meeting held in the capital city of Marawi City. “It aims to reaffirm the role of local governments in promoting peace and order in their communities and promote partnership among stakeholders between the provincial government, municipalities and security forces,” said Army Colonel Daniel Lucero, commander of the 103rd Infantry Brigade, who was among key officials who signed the covenant that included top police officials, town mayors, and representatives from nongovernmental organizations, academe and the local media. “Governor Mamintal Adiong Jr, expressed his delight upon seeing the different sectors of society gathered together to talk about the resolve of peace and security issues of the province,” Lucero said. Lucero also briefed those who attended the peace conference about the security situation in Lanao del Sur, one of five provinces under the Muslim autonomous region, and introduced a new internal peace and security plan called “Bayanihan,” which he said is the core of all operations of the Armed Forces of the Philippines. He emphasized the significant role each sector of the society must play in order to transform the national aspiration of a peaceful and progressive country into reality. The army also put up a so-called “Brigade Hotline” where citizens can provide information that will help authorities solve crimes or concerns that matter the military or its soldiers.